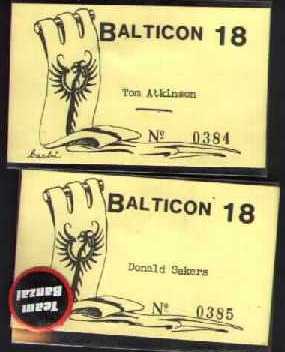 With Balticon 18, the committee tried to focus more towards fantasy than SF. The membership, however, paid no attention, already being focussed more toward parties and SCA-type events. 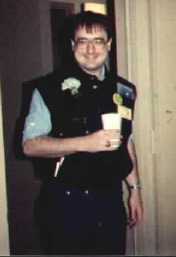 This was Don's first Balticon as a program participant; he was on a Sunday-morning panel on "Editing and review of short stories." 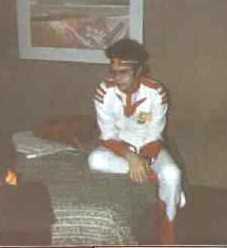 This was the first con at which Thomas and Don roomed together. Thomas wore his stormtrooper armor in the Masquerade, then to the Art Auction where he was bidding on a Vicki Wyman piece. A bidding war started . . . until Thomas, clad in armor, stepped forward and growled at his opponent. The man dropped his bid and Thomas got the picture. In the masquerade, Thomas stood in line behind Londo Massey, who was made up as Venger from the Dungeons & Dragons cartoon. Despite spending hours talking to Londo, Thomas had no idea what Londo looked like without his costume and makeup. Since ConStellation there had been a shakeup in Baltimore fandom. The ConStellation debt, which was still much in the air and was still far from paid off, still rankled. Scapegoats were found and drummed out of BSFS (the Baltimore Science Fantasy Society) -- unfortunately, many of the scapegoats were not the same people who had caused problems for ConStellation. Although the pocket program said " . . . we are on good terms with the Hyatt and we want to keep it that way," events proved otherwise: the Hyatt had become disenchanted with all these SF fans who were crowding their lobby during a fashionable and very profitable Easter Sunday brunch -- in any case, after Balticon 18 the con committee thought it best to locate another hotel. 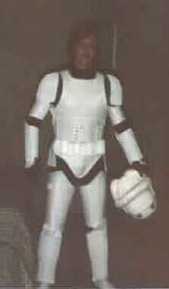 Left: Thomas in his Stormtrooper armor. Left: This is either Will Brehm, or a despondent Crest Kid.